As the country ground to a halt last week, the football fixtures took a battering. Up and down the land matches were called off when in the past an orange ball, cleared pitch markings and a can do attitude from officials, players and supporters saw matches going ahead. Matches used to be called off for frozen pitches, not slippy side streets. Yet in modern, health & safety conscious Britain, with pitches cleared by under-soil heating, games are likely to be called off for fear of a nasty slip on the steps of the stand, or a failing infrastructure/transport system, rather than a genuine problem with the pitch. Sheffield United v Reading a week last Saturday being a case in point. Growing up in the 80's matches were generally postponed or abandoned for one of three reasons, frozen pitch, waterlogged pitch or fog. It is hard to think of many other circumstances that are the exceptions to the rule. Middlesboro and their failure to make a match at Blackburn due to squad illness in 1997, The postponement of a game between Liverpool and Newcastle in 1997 due to the death of Princess Diana and several Scottish games in the wake of the tragic death of Motherwell's Phil O'Donnell. Aside from these, there was one postponement that many wont be aware of. 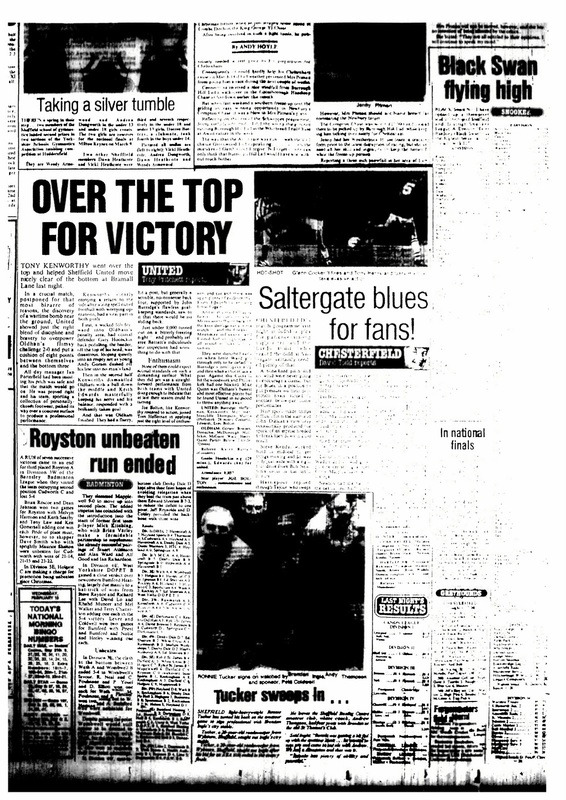 Sheffield United v Oldham Saturday 9th February 1985 - Postponed UXB! First a quick history lesson, which I make no apologies for. This week Sheffield has been commemorating the 70th anniversary of the Blitz hitting the city. On Sunday 12th December 1940 the first wave of the Luftwaffe swept over the city, with 9 hours of intense bombing followed by a second raid 3 days later. 2,000 people were wounded or killed, 40,000 made homeless. Mass devastation across the city centre and other densely populated areas. Even those with a minor interest in history could not fail to be moved by the stories being published from those who survived. They are scary, moving and just so hard to imagine for those who never lived through it. Surprisingly, rather than hitting the steelworks of the East End, where the temporary home of Rotherham United - the Don Valley Stadium - now stands, large areas of the city centre and immediate areas to the west were worse hit. Some suggest that foggy weather conditions impacted on the planned targets being missed, others suggest that the early radar beam the Germans used to identify targets was bent away from the East End by the British. Bramall Lane's close proximity to the city centre saw it hit, as was the nearby timber yard of future benefactors and sponsors Arnold Laver. Both the the Kop and the John Street Stand were damaged. 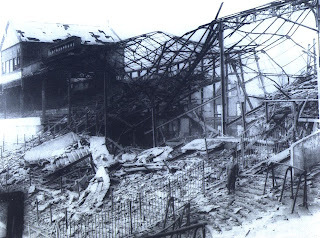 The picture below shows a huge crater and partial collapse of the John Street Stand. There are may stories regarding the bombing. One that stood out suggested that the German maps were so accurate that it described each building in the area and what business was undertaken there, yet the only mistake was to describe Bramall Lane as a boating lake! Some may argue that there have been times since where calling it a football ground has been an inaccuracy given what we have sat through. In time the ground was repaired, although some matches were played at Hillsborough in the intervening period. It appeared that the disruption to football was over. 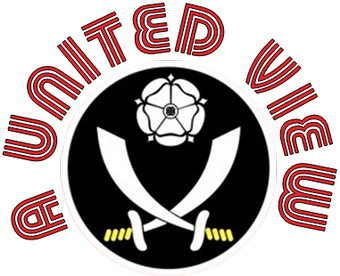 However 40 years after the end of the war, Sheffield United were to suffer again, albeit briefly. 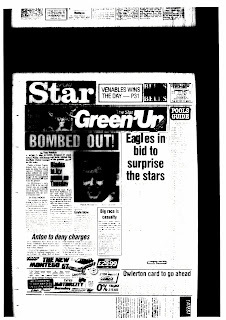 Friday 8th February 1985, snow lay on the ground, but it wasn't the wintry weather which was going to be the cause of this postponement. While excavating for a new housing development, an unexploded bomb was found on a building site in Lancing Road, which runs parallel to Shoreham Street and United's Kop. The 33rd Engineer Regiment (Explosive Ordnance Division) were called out to deal with what proved a particularly tricky explosive. Early investigations established that what was thought to be a 500lb bomb, was in fact a 2,200lb bomb. Over 300 people were evacuated from their homes in the tightly packed terraced streets in the vicinity of Lancing Road and the risk to public safety was enough for United to postpone their Division 2 game against Oldham. The area around Lancing Road would have been used for street parking on match days. It took over 36 hours for the bomb to be defused, the explosive steamed out in sub-zero temperatures, with the regiment's work eventually completed on Monday 11th February 1984. In the original records of bombs dropped on Sheffield, it showed that a bomb had been dropped in that area but not found, until the excavator struck metal. 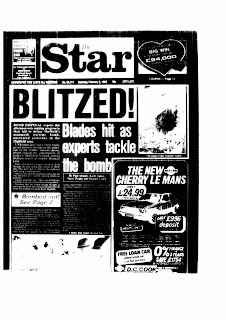 The Blades match that had been due to take place on the Saturday, had been quickly re-arranged for the following Tuesday (12th February) on the assumption that the bomb would be dealt with by then. That in itself was something that wouldn't have been possible these days, as police and the authorities would need at least a week's notice to be prepared for a re-arranged match. Thinking back I remember a picture, published at the time, where on the Saturday the groundsman had written on the snowy pitch "Game Postponed - UXB". Sadly I could not locate a copy for inclusion here. With the all clear the previous day, the game went ahead with United winning 2-0 in front of just under 9,000 fans. The delay was probably to United's benefit as an injury crisis meant that they were likely to be missing key players on the Saturday, the delay allowing additional time to recover. One player whom it didn't benefit was Paddy McGeeney, a young player full back who had come up through the ranks at Bramall Lane. Having made his debut in an Associate Members Cup match the previous year he was all set to for his first league start on the Saturday, only for the delay to mean he was no longer needed on the Tuesday night. He waited another 5 games to make his League debut, albeit in a much bigger game, a home victory over Leeds in front of a crowd of over 20,000. Thinking back I remember a picture, published at the time, where the groundsman had written on the snowy pitch "Game Postponed - UXB". Sadly I could not locate a copy. This has to be one of the most unusual reasons for the postponement of a professional football match, although I am aware of a Serie B match between Salernitana and Frossone in 2008 that was called off for similar reasons. It is also particularly poignant at this time of remembrance in the city. A sad reminder of a time when our country was at war and many civilian lives were lost. But let's not forget that one of the few constants throughout wartime was football. An outlet that freed the people from the strains of everyday wartime life and gave them much enjoyment. 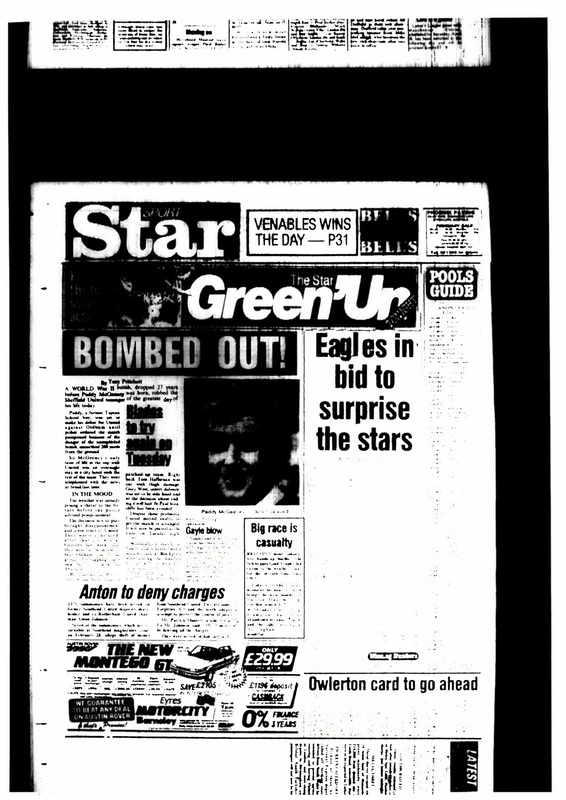 Who would have known at the time, as football continued throughout the war, that football would be affected in peace-time over 40 years later. To read more about Wartime Football and the "unofficial internationals" can I suggest you hop over to the excellent footysphere site where the first in a series of articles has just been posted. I too remember that photo where the groudnsman had written 'UXB' - keen to find it if anyone knows where it is!